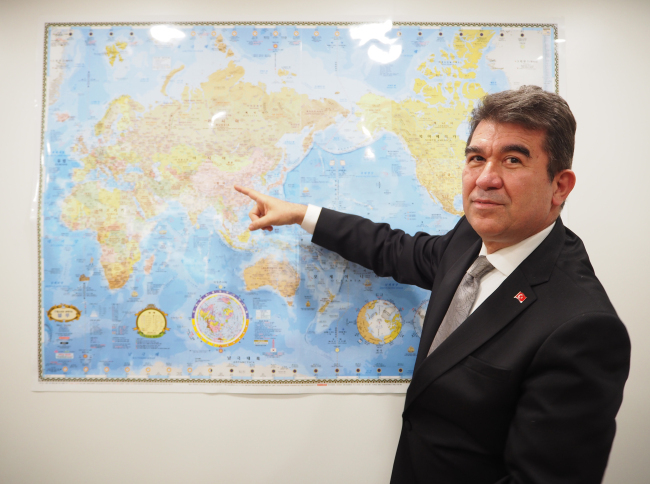 Two years after an aborted coup attempt in Turkey, the country has regained much of its domestic stability and security, stressed the top Turkish envoy to Korea, urging the international community to show understanding toward a nation that has undergone a test of its existence. July 15 marks the second anniversary of the failed putsch, orchestrated by anti-government forces that laid deep inside the Turkish state apparatus. Aiming to overthrow President Recep Tayyip Erdogan, coup plotters staged a nationwide mutiny, bombing the office of the president, the Turkish Grand National Assembly and other state and public buildings with F-16 fighter jets, combat helicopters, armored vehicles and tanks. The coup attempt lasted several hours, and was foiled by Turkish people who took to the streets to fight the mutineers. At least 250 people died, including civilians, soldiers and police officers. Ankara has blamed what it calls the Fetullah Gulen Terrorist Organization -- helmed by Turkish Islamic cleric Fetullah Gulen, who lives in exile in the United States despite Ankara’s demands for his extradition -- as the event’s mastermind and culprit. Judicial processes against the coup plotters are continuing, he added, claiming the process was being conducted in accordance with fundamental rights and freedoms as well as the rule of law as prescribed by Turkish law. More than 110,000 Turkish public sector workers have been sacked as part of an ongoing purge, which authorities say will end soon. The number includes 18,632 civil servants from the latest round of dismissals. Aside from fighting FETO, Turkey is simultaneously targeting and battling a number of terrorist organizations around the country, particularly in Syria and its Afrin region, as well as Iraq, the envoy noted. In the midst of a nationwide crisis, Turkey has welcomed 3.57 million Syrian refugees, who fled their war-torn country following a bloody civil war. It makes Turkey the largest recipient of refugees in the world. “We have not only provided them food and shelter, but also access to education, health services and labor market,” Ercin said, adding irregular migration is an urgent and growing challenge for the international community that requires more cooperation between states. Turning to Erdogan’s recent election as the Turkish president under a new governmental system, in which the office of the prime minister was abrogated, the ambassador said the elections were held fairly and transparently under foreign observers’ monitoring, including the Organization for Security and Cooperation in Europe, the Parliamentary Assembly of the Council of Europe and the Shanghai Cooperation Organization, among others. Erdogan visited Korea on May 2-3 to mark the 61st anniversary of bilateral diplomatic relations. Four cooperation agreements were signed during his visit, encompassing education, information and communication technologies, satellite-space technologies, health care and medical sciences. The Turkish president also held meetings with top executives of Korean conglomerates, discussing investment opportunities and construction projects in Turkey. “Turkey offers tremendous opportunities for foreign companies due to its unique geographical location, strong connectivity and generous incentives provided by the government,” according to Ercin. The two countries have a bilateral free trade agreement in force since 2013. Turkish exports to Korea reached $548 million last year, an increase of 13 percent from the previous year, according to the embassy. Turkey imported $6.6 billion of Korean goods during the same period. Korean investments in Turkey topped $2.3 billion last year, while Turkish investment here was around $35 million. Korean conglomerates have taken part in large-scale infrastructure development projects in Turkey, including the Northern Marmara Highway, Yavuz Sultan Selim Bridge and Avrasya Tunnel. The widest suspension bridge project in the world, the 1915 Canakkale Bridge, will be constructed by a consortium of two Turkish and two Korean companies. Korean enterprises have also invested in projects in Turkey’s energy and health sectors. Gaziantep City Hospital is currently being built by Turkish and Korean construction companies, and on the energy side, Tufanbeyli Thermal Power Plant, with capacity of 45 megawatts, was built by Korea’s SK Construction and Engineering. The Konya Renewable Energy Project with a projected $1.3 billion investment is jointly being undertaken by Turkish and Korean firms. The ambassador said that Turkey had to take retaliatory measures against Washington’s protectionist policies, as an additional 25 percent tariff was imposed on Turkey’s iron and steel and a 10 percent tariff on its aluminum. In response, Ankara slapped tariffs on 22 American products, including coal, paper, walnuts, almonds, tobacco, unprocessed rice, whiskey, automobiles, cosmetics, machinery equipment and petrochemical products.